I enjoyed a great, middle-class childhood. It wasn’t perfect, but my three brothers and I transitioned to adulthood without a single appearance on Dateline and no one in the Prince William County police force knows us on a first-name basis. I didn’t raise any children, but I know that launching four kids into adulthood without jail time and/or massive therapy bills is an amazing feat worthy of celebration. We didn’t have a lot of money, but we never went without. Dad worked hard to put a roof over our heads, and my brothers and I were fortunate to grow up under the watchful eye of a stay-at-home mom. We came home when the street lights came on, and we passed the evenings watching The Rockford Files together as a family. There was no helicopter parenting and/or buying our admission into fancy colleges, but they did spring for little league uniforms and equipment. We grew up with a lot of rules set by the people paying the bills, and we were free to leave any time we felt we couldn’t follow them. Amazing Feat #2: My parents’ marriage lasted 52 years until Mom’s passing in 2006. Speaking as a woman who has less than five years of marriage under her matrimonial belt, I am humbled and in awe. I’m the baby of the family and the only girl. Dad and I were already close, but we have gotten even closer since Mom passed. He and I have always shared a special bond. Don’t get me wrong—I loved my mother, but Dad and I always had each other’s backs. 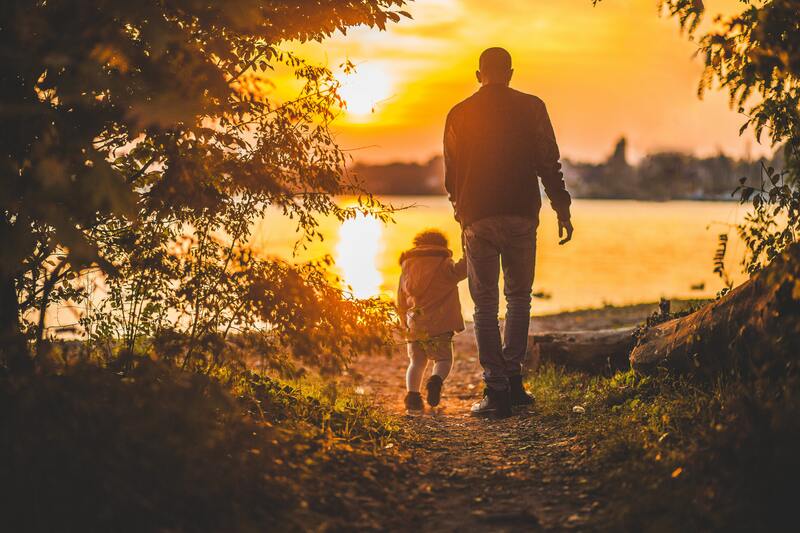 Dad set the curfews growing up, but he was also the one who gave you the nudge needed to leave the nest on your own and go explore. I remember the first time asking to leave their side at the mall. Mom immediately said, “No—stay here with us.” It was Dad who said, “It’ll be alright. Meet us by Orange Julius in thirty minutes.” Those first few bursts of teenage freedom and independence were euphoric and mostly thanks to Dad. He is also the one who took us out in the ocean to ride waves for the first time while Mom watched from the safety of her beach towel. I only just recently discovered that my Dad never really knew how to swim, but somehow he managed to help us navigate our way not only around those waves, but life in general. Dad started seeing a lady a couple of years after Mom passed. It was awkward at first to watch him with someone other than Mom, but my brothers and I were thrilled to see Dad starting a new, post-mom chapter. Our motto through everything has been “whatever makes Dad happy.” About two years into their relationship, they decided to relocate from Virginia to Florida. It was the first time in my life that my father was more than an hour away, and it took some getting used to only being able to see him a couple of times a year. He had never lived outside of Virginia (except for his time in the military) so I think it was exciting for him at first. Frankly, I think it took a lot of courage to make such a big change at that stage of his life, leaving his comfort and familiarity behind. Unfortunately, age and failing eye sight have been creeping up on Dad these past few years so his partner has taken on more of a caretaker role which has been hard on both her and him. He can no longer do the things he loved – like mowing the lawn, taking care of the yard, fixing anything and everything. It’s been hard to watch from the outside looking in, and so I can only imagine how frustrating it is for him. In February, Dad took a fall that resulted in a hip replacement. It scared the bejeezus out of us, but it was also a wakeup call. It became time to get real about dad’s ongoing care, what he wants and needs, and how we can help. It is also time to get his affairs in order, a process he started with our mother many years ago. It’s time for tough conversations. There are a lot of big questions that only Dad can answer. A lot of folks avoid asking the questions and then they are left wondering what their loved one would have wanted. Me, I’m a planner. I like having a set of clear instructions so there is no room for error. One decision has been made—to bring Dad back to Virginia to recover once he is given the green light from his surgeon. We are about to embark on the stage of life when parent/child roles get reversed. Our strong, capable father whom we relied on and leaned on for so many years now needs to lean on us. I’m not sure I’ll do as good a job for him as he did for me, but I am up to the challenge. And, the best part—Dad will be there to help navigate us through this stage as well.